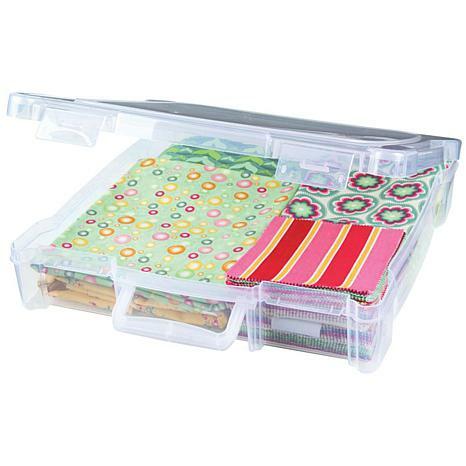 Take your scrapbook papers to-go with a convenient storage system. 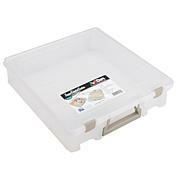 Perfectly sized to hold your favorite scrapbook papers, this box keeps your supplies crisp and secure so you can keep on craftin'. I got this for my little nephew who's into writing, so I filled it with composition books, pencils, etc. just perfect ! 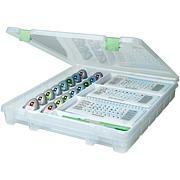 I bought 2 of these boxes to organize my cardmaking supplies. I love that these boxes have handles, others I have aren't quite as portable. These boxes are sturdy and well-made, and I'm sure I'll pick up a few more somewhere down the line! I am ordering 5 more, this is so much better with 2 clasp and the handle, them the 6 others I purchased this year they were not easy to open and close. 100% recommend this one for cardstock paper. PERFECT for me AND MADE IN THE USA!!! 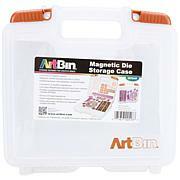 I love these ArtBin Boxes w handles - I actually bought 2 of them, even though no one could tell me how deep they were...!? I was planning to put cardstock in them & if they were 3" or over, they would be heavy & difficult to manage! Well, they actually are 3" but I can combine my cardstock with other supplies, using a piece of shipping stock to protect the paper, so that they are a manageable weight. 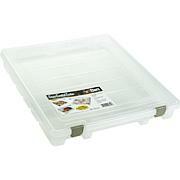 The handles are great, the boxes are sturdy and I'd like to buy a few more for other supplies (great price!) & build a cart on wheels for all of them! THANK YOU for offering products MADE IN THE USA!! !